How to prepare butter milk at home? The liquid portion which remains after separating butter from Yoghurt is called as butter milk or “takra” . Butter milk is a low fat skimmed milk with almost 2% of fat content. The butter milk is supposed to contain 90%of water, 5% of milk sugars, 3% of milk protein, 2% of fats and high in potassium, vitamin B12, riboflavin, and calcium. Butter milk is sour-salty in taste due to lactic acid that is produced by the action of bacteria. Ayurveda considers buttermilk a health drink. Butter Milk is a thirst quencher, a weight reducer, a source of vital nutrients, a body detoxifier, an intestine cleanser, relieves acidity, indigestion, diarrhoea and dehydration, reduce excess kapha and pitta in the body, treat anaemia, insomnia, bloating of the stomach, and even the effects of poison. Ayurvedic buttermilk is very different from what we call buttermilk in the West. Butter milk can be prepared easily in home and it is among the best milk product for good health. Blend yogurt for 3-5 minutes on low speed. Add cold water to yogurt and blend again for next 3-5 minutes. Then fat will be separated up as foam. Collect the foam layer. Repeat blending the mixture if the yogurt stills seem thick and again collect the upper layer. Add the spices/herbs cumin, coriander leaves, rock salt, asafoitida and stir with spoon. Then the final preparation is butter milk. Butter milk can be prepared simply mixing yogurt, cold water and sugar as per taste. 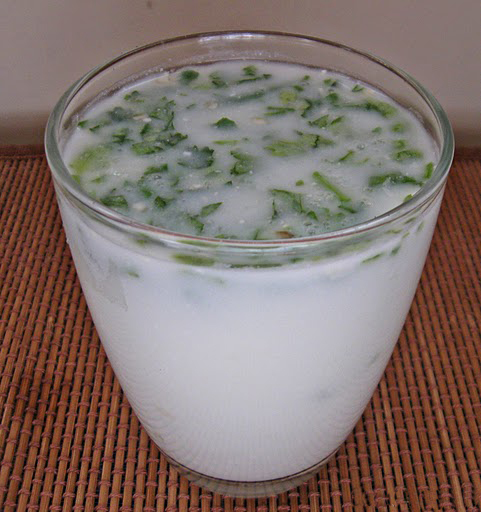 Traditionally, buttermilk was prepared by churning yogurt and water with hands in absence of mixer, blender.